This study examines how changes to the functioning of the world’s food and agriculture system can contribute to reduced hunger and the attainment of global food security. The challenge is wide ranging and multi-faceted. While food production will respond to the demands of a rising and more affluent world population, effective government policies can stimulate productivity and contain upward pressure on food prices. They can also help ensure that land and water resources are used more sustainably, and that farmers have the capacity to manage risk and adapt to climate change. Trade will have an important role to play in ensuring that resources are used efficiently and sustainably, and in getting food from surplus to deficit regions. At the same time, multilateral reforms are needed to ensure that the world trading system functions more smoothly and fairly than it has done in the past.Approximately two-thirds of the world’s poor live in rural areas, where farming is the principal economic activity. This study considers how government policies can raise the incomes of agricultural and rural households, and thereby improve poor peoples’ access to food. 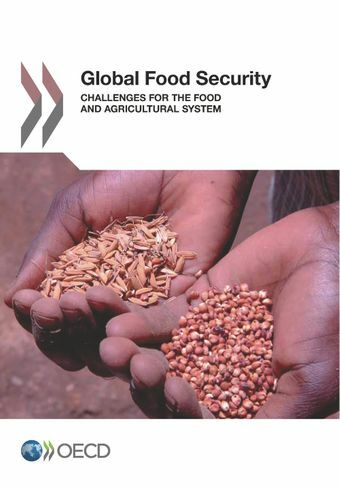 Yet while income growth is essential for long-term food security, it is not sufficient. Complementary policies, for example to improve health and sanitation, are required to ensure improvements in peoples’ nutrition. Action is thus required on many fronts. The purpose of this study is to help policymakers establish priorities at global, regional and national levels.